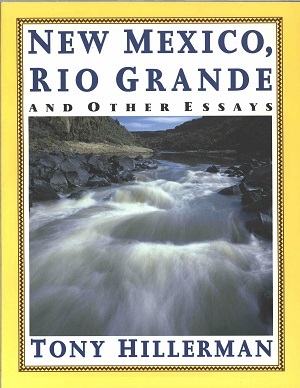 This is the paperback edition of Tony Hillerman's New Mexico, Rio Grande, and Other Essays, published by the HarperPerennial in New York City, New York. This volume contains four original essays written by Tony Hillerman which are complemented by photographic images by David Muench and Robert Reynolds. The cover features a photograph of the Rio Grande gorge by David Muench. Binding: Paper covers with full color photograph on cover. The title, authors name and publisher's device are printed in blue vertically on the spine against a yellow background.